Of course, the history of litter cleanup dates back earlier than the Angels. 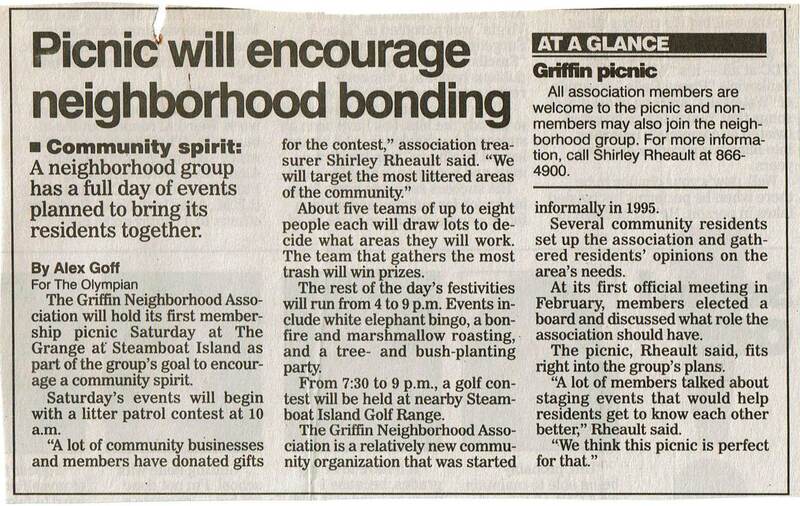 For example, in 1996, the Griffin Neighborhood Association held its 1st Annual Potluck Picnic. One of the events at that picnic was a “Litter Patrol Contest.” Teams of contestants picked up litter from 10 AM to noon. The team collecting the most won prizes. The event was repeated at the following year’s picnic, too. History does not record who won the contest or what the prizes were. What is certain, however, is the entire community benefitted from a little less litter along our roadways. Fast forward to 2018. 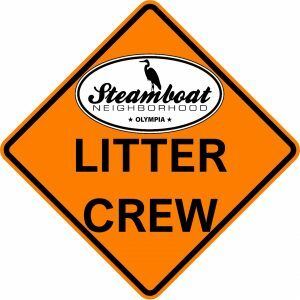 Last year, Steamboat Peninsula resident Rob Helms began organizing intermittent cleanups of roadside litter here in our neighborhood. Another of these is going to be held this Saturday, March 9. Roadside litter cleanup is easy and a fun way to get out and enjoy a walk on a weekend morning. The County provides the litter pickup gear including trash bags, gloves, safety signs, and vests. All you need to bring is water, sturdy walking shoes, and maybe a snack. 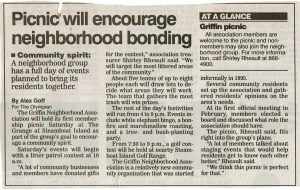 This Saturday we’ll meet at 9 AM in the gravel parking lot across Steamboat Island Road from the Steamboat Tennis Club. We’ll be done by 12 noon. We will meet at the gravel lot across from the Steamboat Tennis Club, corner of Steamboat Island Road and Old Steamboat Island Road. These dates are updated from those originally published with this article. Watch our Facebook Page for more details, as we approach each of these dates. “Aside from the exercise and friendly smiles and waves,” John Dodge wrote in 2006, “members of the Gallagher Cove litter patrol enjoy the natural beauty of a litter-free road, even if it’s just a few miles of road they’re able to keep clean.” This weekend, you are invited to join in a quiet tradition of roadside litter cleanup. The current weather forecast is for a partly cloudy and cool, but not too cold, Saturday morning. Perfect weather for a walk with some congenial company.